IGI streamlines access management, automates the identity lifecycle process and reduces the need for manual labor. Its capabilities include powerful role management, multilevel provisioning workflow and integrated password management. IGI offers a rich set of mature and compatible application adapters, both on-prem and for the cloud. IGI enables the business to run access certification campaigns to reconfirm users access needs with a customizable, self-service user dashboard. This simple experience quickly provides flexible and powerful workflow allowing users to easily recertify access. IGI uses a unique business activity-based approach to model separation of duty violations rather than relying on unmanageable role-to-role comparison. Business activities are immediately readable to the business user and enable a very clear way of showing risk that is both understandable and actionable. 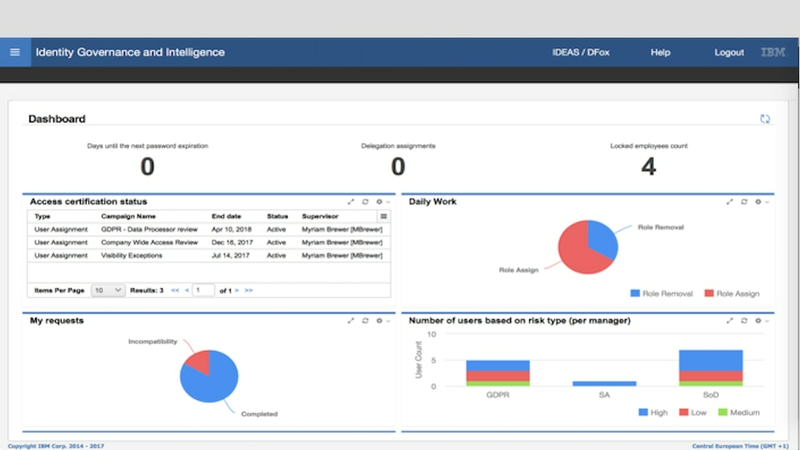 IGI helps you identify areas of risk and access optimization through powerful identity analytics, providing priceless visual insights on risky users and behaviors. This allows for better visibility and user access control for role mining and role modeling. IGI offers a native integration with ServiceNow, the popular service management platform. This integration helps users facilitate requests in the ServiceNow interface they are accustomed to, paired with comprehensive governance capabilities from IGI keeping them secure. IGI provides you with full coverage of password management. This helps ensure that the end user experience is better and more secure, utilizing Password Synchronization, Reverse Password Synchronization and The Desktop Password Reset Assistant (DPRA). IGI integrates with several PAM products, allowing organizations to centrally manage and control all identities, including privileged identities and entitlements. With this integration you can manage certification, delegation and separation of duties. IGI provides fine-grained, (transaction and authorization object level), controls on detecting separation of duties violations on SAP users and roles. It supports SAP role cleansing and user violation mitigation. IGI helps organizations ensure that the personal data they process, collect and store is properly protected, allowing only the right people to access and manage the right data. IGI provides a business readable representation of GDPR risks. This business context helps a non-technical user decide the appropriateness around access, leading to more efficient decision making. IGI integrates with Qradar UBA to tackle insider threat detection and remediation. Depending on the risk score derived from UBA, IGI can take action immediately, containing the threat and responding with additional verification, temporary suspension or shutdown of access. Beyond provisioning, IGI allows for fine-grained control on RACF, allowing you to apply certifications and separation of duty controls to group resources and access levels. It supports RACF group cleansing and user violation mitigation. IGI allows you to combine preventative and detective controls such as least privilege and separation of duty, to be flexibly modeled and reviewed by business users and promote the involvement of the right stakeholders in defining the policy and reviewing the violation detected. Traditional identity systems with complex roles and IT entitlements often leave business users in the dark, unable to make sense of simple access requests. IGI uses business-centric activity data to help end users and line of business managers understand the nature of the access they are requesting. This means they can ensure users have proper access to applications and systems. Line of business owners need to have effective tools to manage user access to IT resources. IGI provides a business friendly user interface to help line of business owners request, review and approve access for team members and automate end-to-end provisioning for user’s access to Servers, Applications and Database systems. IT Systems need to detect malicious user activity and respond quickly to prevent and contain insider threats. When anomalous use behavior is detected by Qradar/UBA, the user’s accounts are suspended in IGI, and an orchestration of the offense is initiated to engage the user via IBM Verify to mitigate the risk and follow up with proper actions. Secure and simple user access management for employees and consumers. Block malware attacks with least privilege and application control.